This comic is an animated delight. I had the opportunity to read the three issues of Horus all at once. Had I not, it might have been a bit puzzling, since the issues were published a year apart. The comics are breathtaking. I felt like I was watching an ancient Egyptian cartoon. 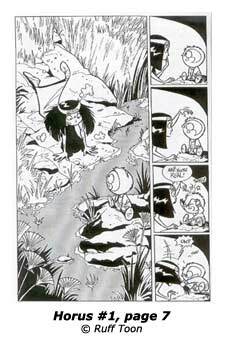 Matte has a very smooth, clean inking and pacing style. Horus follows the antics of an ancient Egyptian family, particularly eldest daughter Nofret, who makes a wildly curious discovery on the banks of the Nile. That discovery is the little Horus … he’s adorable. There are no other words to describe him. Matte outdid herself. He looks sort of like the little chicken in the Foghorn Leghorn cartoons of Looney Tunes fame, but not quite. Nofret’s little brother looks a tad too much like Bonk from Bonk’s Adventure, but, ah, who can I, as big time old school gamer, fault a possible fellow Turbografx 16 fan for an artistic homage? Overall, these are cute, fun comics. The color scheme is black and white with gray shading; the art and inking are top notch and clean. The art style is not quite manga, yet not quite Disney, either. It displays energy and enthusiasm, and does what graphic art is supposed to do: it tells a story that reveals one answer, while leaving two more questions in the mind of the reader, luring the reader further into this richly written and drawn world. It is like slowly peeling the layers from an onion, finding more interesting layers the further you delve. For example, how do the locals respond to a little hawk tyke with the power to … let’s just say he is strong. I liked it. I should also note that the use of a certain creature for the “Seth” animal — an animal which historically no one has ever identified — is very interesting. You can’t have a Horus story without some form of conflict, and tests of strength and power coming from Seth. They are there, and shown with a little bit of camp, but also with a lot of force and kinetic energy. As these are single issue comics, from an independent publisher, there are back stories/filler, as well. These back stories range from spoofs of Harry Potter and Garfield, to a cute yet somewhat creepy look at darker areas of paganism. My understanding is that these are not included in the collected version of Horus and that might be a good thing. I say this because, while the back-ups range from cute to funny, one cute story crossed a line: while that tale poking fun at mages was enjoyable, there is a scene with a character who gets more than I think is appropriate for this kind of clean cartoon style. I would hesitate in giving this to a child for that reason, as the scene involves an animal and could be construed as a negative stereotype even if this was not intended. While that one blemish detracts from the enjoyment of the other books, it was marginal. I recommend this story to any fan of Horus, the little Heru, who wants to see him act like Bonk in Bonk’s Adventure, and anyone who is looking for a read that has just the kind of fun many dark comics are missing these days.